Frank is the withdrawn owner of a mannequin store, but his life changes when young artist Anna appears asking for his help with her new exhibition. As their friendship develops and Frank's obsession escalates, it becomes clear that she has unleashed a long-repressed compulsion to stalk and kill. A 21st century Jack the Ripper set in present day L.A., Maniac is a re-boot of the cult film considered by many to be the most suspenseful slasher movie ever made, an intimate, visually daring, psychologically complex and profoundly horrific trip into the downward spiralling nightmare of a killer and his victims. 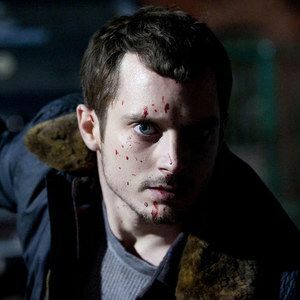 Considered an icon of his generation at only 32 years of age, Elijah Wood literally goes inside the mind of Frank, the killer with an appetite for scalps. Though shot mostly through the character's POV, we caught up with the actor to talk about his unique experience on set, which required him to be available at all times despite his limited amount of screen time. Check out our exclusive interview with Elijah Wood as he expands his artistic reach with this truly great thriller from writer/producer Alexandre Aja and director Franck Khalfoun. In select New York theaters and available on VOD now. In select Los Angeles theaters starting this Friday, June 28. On a psychological level, what do think is scarier for people who may not know what they are getting themselves into? Maniac or Season 3 of Wilfred? The episodes are unnerving. I think the show is scary. Elijah Wood: Well...I think there is a way to look at it where it's a little frightening. But, you know...(Laughs) He's accepted that there is a man in a dog suit in his life. Because we are seeing it through that lens, we're seeing it for the beneficial benefits he gets rather than the darker implications. Elijah Wood: That is interesting. I hadn't thought about that. But I do see the parallels that you are hinting at. On a psychological level, there is an accordance. One being darker than the other...I think...One obviously being a comedy. But perhaps this is true. I think horror or genre fans would like the show anyway. It is definitely a bit weird. Alexandre Aja has a great comedic sensibility despite his horror background. How available was he on set, and how much influence did he have over the finished product in terms of his work on Maniac? Elijah Wood: Very. You know, he wrote the script. So the adaptation is his, with director Franck Khalfoun's inclusion in that process as well. But he was on set every day. Him and Franck Khalfoun have known each other for years, and they have worked on a number of projects for years. So it was a real collaborative experience on set. Alexandre Aja knows the genre really well. And he would have really subtle ideas that would be extremely effective. It was amazing to see what he could add to something with just the tiniest little note. He's great. He was wonderful. Elijah Wood: Right. Yeah. It was proposed as two weeks of work, just to shoot the reflection shots. They started talking about hiring a double for my hands. To approach the camera, or whatever. It was at that point I realized that those hands were going to be making decisions, just from the character's standpoint. I thought I should really be a part of that process. Ultimately, we all sat around and I said, "I think I need to be on set every day." It ended up being a great collaboration, and discovery process every step of the way. We discovered things on a daily basis that none of us had anticipated. That certainly resulted in a movie where we didn't even know how it was going to turn out. Elijah Wood: You're probably right. I didn't even think of that, but you're probably right. We did have a hand double, because there were a couple of moments when both hands had to broach the lens, and it's difficult to get both arms around the camera. There would be a double for my left or right hand, depending on what the scenario was. There was a double, because it was necessary for that moment. But you bring up a great point. If people were familiar with my hands from other films, they would pick up on that. Elijah Wood: (Laughs) Yeah, right, right! How does creating a character for yourself affect the rest of the crew, when they are more in charge of having to bring this character alive alongside you, instead of merely focusing the camera on you? That really becomes a shared effort, I would think? Elijah Wood: Each of the scenes was blocked in a very traditional way. Without the DP there. In some ways, it was a traditional approach, at least in blocking and scene construction. That includes the character's performance, too. That was helpful because we could really work things out as actors. And from there, work out technically where the camera needed to be once that was applied. That was often a bit of the puzzle. Sometimes we were in environments that were relatively crammed. We had to figure out how to begin and end a scene. We couldn't rely on traditional coverage or editing. So it was always an interesting process, finding out how we would arrive at a scene, how it was broken down, and ultimately shot. I think it was maybe a year ago when we first heard some of the early reviews. Maybe I'm a little off on my time line. What's interesting to me is the fact that a lot of horror remakes come out, and the horror and genre fans just automatically don't want to see them. But here, it was understood that this was something different. That it wasn't your average, run of the mill, worse than the original so why bother remake. How do you think it works in letting fans know this is something new and different, and in terms of this particular film, why do you think horror fans picked up on that so quickly? Elijah Wood: Well, I think it comes across naturally...I hope that is true...When you've made something with the intention being based on a pure excitement for doing something new, and that there is an integrity within the storytelling process that really is fueled by a differentiation from the original...I think that just naturally comes across. You know what I mean? I think in the communication to people...Because we made it with pure excitement, and the filmmakers involved came at it with purely artistic intentions, in this particular way to tell the story...I think its that authenticity you are talking about, that horror fans can smell a mile away. And they know when its not there. It comes across naturally, I think. It feels fresh. And it feels exciting. I think that has so much to do with what Maxime Alexandre did as the director of photography, and what Rob did with the score, its so rich, tonally. It is so evocative of late 70s, early 80s scores in the genre. It's down to the POV style. The whole thing has resulted in something quite unique within the whole genre. I think you nailed it when you said that it is a natural vibe that just comes off the film. I like the new Evil Dead remake. But it seemed like manufactured hype, from the filmmakers themselves, that this was something new and above the original. I don't feel that the horror fans came to that conclusion on their own. Here, I feel like they narrowed in on this, and found it themselves, and saw what it was without having to be told. Yes, exactly. The word spread quickly when the film played the festivals, under any studio made hype that was paid for through promotional means. I think people take for granted that the horror fans are smart sometimes. Elijah Wood: Dude, they are an extremely suave audience, and its amazing to me sometimes that they get sort of undervalued in regards to their intelligence and insight. The thing about horror film fans and genre fans in general is that they are fans of a wider swath of cinema. So, they are suave. When it comes to remakes, we are all a little tired. The expectations going into these things tend to be on the low side, because we've been hit with a barrage of them over the last ten years. That's what's so interesting to see with Maniac. People are genuinely excited for a remake. It's actually cool. It does feel like The Fly or The Thing, which are those rare moments. Elijah Wood: Yeah, I know. Its fun. And it's gratifying to know we've made something that is appreciated amongst the genre community. My main concern once we finished the film, knowing how discerning the genre audience is...It was their reaction I was most concerned about. I know my ten minutes with you are up, but I wanted to throw this out there real quick. I know Jason Gann has said that we'll probably never see the real dog behind Wilfred. But with Legit being on FX, and it taking place near Venice Beach as well, is there any chance we might see Ryan and the real Wilfred somewhere in the background? Elijah Wood: That's interesting. That has never been discussed. But that is an interesting proposition. Especially if it was really far in the background, and it was more of an Easter Egg. That would be kind of cool. If it was a blink and you miss it situation, that would be appropriate. I think that would be cool!